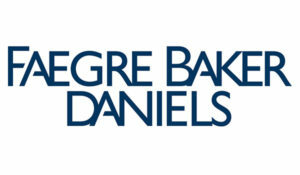 Faegre Baker Daniels is a full-service law firm dedicated to serving the needs of local, national and international businesses. Our more than 750 legal and consulting professionals provide the depth and breadth of expertise necessary to solve complex business challenges. From U.S. locations in Silicon Valley, Boulder, Denver, Chicago, Fort Wayne, Indianapolis, South Bend, Des Moines, Minneapolis and Washington, D.C. to international locations in Beijing, Shanghai and London, we serve clients in every U.S. state and more than 100 countries. Our legal services include: benefits and executive compensation, business litigation, client technology solutions, construction and real estate, corporate, environmental, exempt organizations, finance and restructuring, government advocacy, health care and FDA, insurance, intellectual property, international, labor and employment, product liability, tax, and wealth management. Our practices are complemented by experience across a wide range of industries, with a strategic focus on energy and natural resources, financial services, food and agriculture, and health and life sciences.